This 1.9-mile-long surge barrier was built near the confluence of the Gulf Intracoastal Waterway and the Mississippi River Gulf Outlet to mitigate flooding risks. Tetra Tech INCA won top honors at ACEC Washington’s Engineering Excellence Awards for its work on the design. Tetra Tech INCA took top honors at the American Council of Engineering Companies of Washington’s 44th Annual Engineering Excellence Awards ceremony on Jan. 20 at the Westin Bellevue. The event honored 50 projects representing a wide range of engineering achievements. ACEC Washington’s top seven awards (one platinum and six gold) will go on to compete in the ACEC national competition in Washington, D.C., in April. 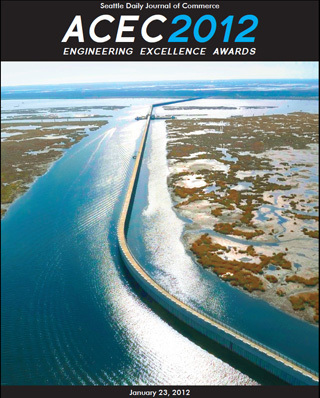 The platinum award was presented to Tetra Tech INCA for its management of the design of the Inner Harbor Navigation Canal/Lake Borgne surge barrier and its design of the Gulf Intracoastal Waterway sector gate and a vertical lift gate at Bayou Bienvenue. Best in state awards were also given to 43 local projects. Members of the five-judge panel were Ralph Graves, managing director of capital development at the Port of Seattle; Greg Miller, chair of the University of Washington Department of Civil and Environmental Engineering; Noel Miller, former director of Edmonds Public Works; Mike Jobes, principal at Miller Hull; and Karen Say, president of Saybr Contractors.